Phase One (Part 1) is available to read here. So far we have only covered two of the Earth-bound titles and established the rules of the Marvel Cinematic Universe (MCU) on our journey to Avengers: Infinity War. Now that Marvel had gained confidence in banking on lesser known characters and turning them into A-list superheroes, it was time for them to go bigger and go cosmic. As the MCU entered its third year, Marvel President Kevin Feige decided to steer away from science and technology by taking a trip along the Bifrost to bring the Norse God of Thunder to the big screen at last. Thor, the arrogant heir to the throne of Asgard breaks a truce between the forces of Asgard and the mighty frost giants of Jotunheim and is subsequently banished to Earth. Meanwhile, Thor’s scheming brother Loki plans to seize the throne for himself by any means necessary. Actor and director Kenneth Branagh was able to bring his Shakespearian experience and training into Marvel’s world. It was nothing short of a match made in the Realm Eternal. From the dialogue to the intrigue, the film feels like an old school Shakespeare play with a modern, sci-fi twist. Relatively unknown Aussie actor Chris Hemsworth claimed the title role, while brit Tom Hiddleston snagged the role of his brother Loki after auditioning for the God of Thunder himself. Thor spends the majority of the movie without his powers or his mighty hammer Mjolnir, which is a risky thing to do, but pays off by giving him time to connect with the people of Earth as he learns to be a better person. Even though the story revolves around Thor, this also acts as an origin to Loki, setting up his evil future as the God of Mischief and antagonist to the united Avengers. It’s revealed by Anthony Hopkins’s Odin All-father that Loki is adopted and his true parentage is King Laufey the Frost Giant, making him bitter and feel resentment for Thor’s royal birth rite, leading him to send the protector of Odin’s treasure room, the mechanical Destroyer, to kill Thor. The movie introduced the nine realms, planets connected together by the branches of the world’s tree, with two of them actually being shown. The majority would be featured in the future. This film focuses on Thor’s home of Asgard, Midgard aka Earth and Jotunheim, the land of the Frost Giants. The scenes on Asgard introduced us to Thor’s friends, the Lady Sif played by Blindspot’s Jaimie Alexander, and the Warriors Three. The Warriors are made up of the charming Fandral, the hungry Volstagg and the serious Hogun. Idris Elba also makes a small appearance as the golden eyed gate-keeper Heimdall, who is able to see all the souls in the nine realms. He stands guard on the rainbow bridge, leading to the Bifrost, which can teleport someone from Asgard to one of the other realms. On Earth, we are introduced to three characters who would go on to feature throughout the MCU, Natalie Portman’s Jane Foster, Stellan Skarsgård’s Erik Selvig and Kat Dennings’s Darcy Lewis. They stumble across the banished Thor after he lands on Earth and take him to hospital after running him over. Agent Coulson and S.H.I.E.L.D. make a return after the teaser in Iron Man 2, when they come to investigate the crater made by Mjolnir. They have to tangle with the Destroyer, which Agent Sitwell believes to be “one of Starks” until it attacks, and have to face Thor himself when he comes to retrieve his hammer. Coulson proved to be the connective tissue between each franchise and quickly became a fan favourite character. Thor even refers to him as the Son of Coul after being introduced later in the movie. There’s a very small cameo during Thor’s infiltration of the S.H.I.E.L.D. perimeter from expert archer Clint Barton, aka Hawkeye. At the time it was just thought to be a cool little Easter Egg for fans, but the role lead actor Jeremy Renner joining the Avengers and becoming one of the central characters of the MCU. The post-credit scene featured Erik Selvig being taken to meet Samuel L. Jackson’s Nick Fury to discuss a new form of unlimited power. The only problem is Selvig being controlled by Loki. The source of the ‘unlimited power’ is a small blue cube that would play a key part in the events of the next two films. After a few terrible movies in the early nineties, Marvel Studios decided to bring the star-spangled man with a plan to the big screen in a movie he deserved. After all, he truly had waited long enough. Set in the 1940’s, Steve Rogers, a skinny asthmatic man from Brooklyn is given the chance to join the army and become the symbol of freedom against the Nazis and the evil Red Skull as the star-spangled soldier Captain America. Cap is played by former Human Torch Chris Evans, who, while not fans first choice, has become as iconic in the role as Robert Downey Jr. had as Tony Stark. Steve is given the chance to join the army by Stanley Tucci’s Dr. Abraham Erskine. He trains to the best of his ability and is selected to take part in Erskine’s plan. The plan is to use a special serum to transform Steve into a super soldier. The serum amplifies everything inside a person, so good becomes great, but bad becomes worse. This is why Steve is chosen compared to his fellow soldiers, because of his natural compassion and he knows the value of strength. After an encounter with some Hydra agents, Steve is misused as a propaganda mascot by the United Service Organisations (USO). To try and appeal to a wider audience, Steve is given a red, white and blue skin-tight suit with prop shield. Over the years, he stars in films, appears in comic books and goes on tour around the US as the star-spangled man with a plan, Captain America, until his friend, Bucky Barnes, is captured behind enemy lines, forcing Cap to go on a one man mission to save him and the rest of Bucky’s battalion. We were introduced to Agent Peggy Carter, played by brit Hayley Atwell, who went on to star in her own Marvel One-Shot which garnered such high praise that it warranted a TV series: Agent Carter (2014). The show lasted for two season until it was prematurely cancelled due to falling viewing figures. The Matrix and Transformers actor Hugo Weaving slips on the prosthetics as the head of Hydra Johann Schmidt, aka the Red Skull. The Skull is created the same way as Cap, using an experimental version of the serum that unfortunately goes wrong. His scientist partner, Dr. Arnim Zola, played by Toby Jones, is creating new weapons for the German forces using the power of the blue cosmic cube known as the Tesseract, which is said to be the jewel of Odin’s treasure room. The Tesseract is an object of immense power, and one of the six Infinity Stones, but we only see a glimpse of its power in The First Avenger, before it resurfaces to cause more havoc the following year in The Avengers. Being set in the forties, we get to see the foundations of the MCU, such as being introduced to Howard Stark, the father of Tony/Iron Man. We see the original serum that was copied in The Incredible Hulk, there is even a small tease for the original Human Torch from the early comics. We also get to meet Steve’s team of soldiers called the Howling Commandos. It culminated everything that we had seen before and acted as a prequel to the first crossover between all of the characters. The post credit scene made this very clear by showing the first teaser for Avengers Assemble. The four year build up was a painstaking wait. Could Marvel actually pull it off? In April 2012, we found out, and it’s fair to say it was worth the wait. The Avengers sees Iron Man, Captain America, Thor, Hawkeye, Black Widow and the Hulk team up to defend the Earth from an extra-terrestrial threat. Brought together by Nick Fury and S.H.I.E.L.D., the heroes must put aside their differences to become something greater. And who better to tell the story than writer and director Joss Whedon, who had previously created Buffy the Vampire Slayer, Angel and cult favourite Firefly. He was already a well-respected member of the Marvel house as the uncredited script doctor for X-Men (2000), which led to his work on one of the best comic series featuring the mutants: Astonishing X-Men. Co-written by The Incredible Hulk and X-Men screenwriter Zac Penn, The Avengers sees Tom Hiddleston return as the sneering God of Mischief, Loki, who threatens the planet with war in an effort to rule as King. Armed with a mind controlling sceptre that houses the second of the six Infinity Stones, Loki makes light work of S.H.I.E.L.D. by killing multiple agents, destroying their base and manipulating both Eric Selvig and Jeremy Renner’s Hawkeye into obeying him and steal the Tesseract, which is now being harnessed to create unlimited sustainable energy. Fans of the wise-cracking archer were disappointed with the amount of screen time the character had, with most of his appearances being under mind control, even though he gets a fair amount of exciting action scenes including a one-on-one spar with Scarlett Johansson’s returning Black Widow. But with six heroes to bring together, one was bound to get the shortest straw. The rest however are introduced to the story naturally, with Robert Downey Jr’s Iron Man being recruited by Clark Gregg’s Agent Phil Coulson, Captain America meeting with Nick Fury as he comes to terms with the new decade, Thor comes searching for his brother, and the new Bruce Banner being persuaded by Black Widow to come out of hiding to help. Mark Ruffalo took over from Edward Norton as the timid scientist with anger management issues, and while many were sceptical of his take on the character, most were won over within minutes, with a more dangerous and tense relationship between the man and the monster. The interactions were worth a look all by themselves, with each well-rounded character bouncing off of each other in a highly believable way, with some getting on better than others. It also saw the beginning of the rivalry between Cap and Iron Man, which would continue to build for another four years, until coming to a head in Captain America: Civil War (2016). The movie revelled in the heroes friction, with Iron Man and Cap battling Thor in a dark forest, and even featured the first round of who was stronger, Thor or Hulk, with an incredible punch-up aboard S.H.I.E.L.D.’s floating fortress the Helicarrier. The final confrontation between the united Avengers and the Chitauri army is the stuff fans could only dream of. Iron Man’s banter with Hawkeye, Thor and Cap uniting, Black Widow hitching a ride on the alien’s chariots, and Hulk doing what he does best, SMASH! The film closed phase one and set the stage for where the next few would venture. In the mid-credits scene, we were greeted with the first glimpse of a grinning Thanos, who features as the main antagonist in Avengers: Infinity War. What had started out as a standard set of superhero films, soon turned into one of the most successful cinematic franchises in history. The Avengers had proven it was possible to unite multiple superhero franchises in a cohesive way that allowed each character to stand on their own but not hog the spotlight and give audiences a great experience. 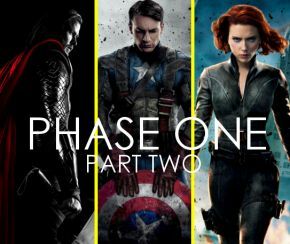 Phase One was now over and the stage was set for bigger and better things to come as Marvel entered Phase Two. The Road to Infinity War: Phase Two (Part 1) is available to read here.